Oh I love this cozy sweater! The sleeves are so fun and the color is just perfect for fall. How gorgeous is that tree?! Enjoy your relaxing weekend with no plans, Shauna! What beautiful photos of the most beautiful Fall model!! 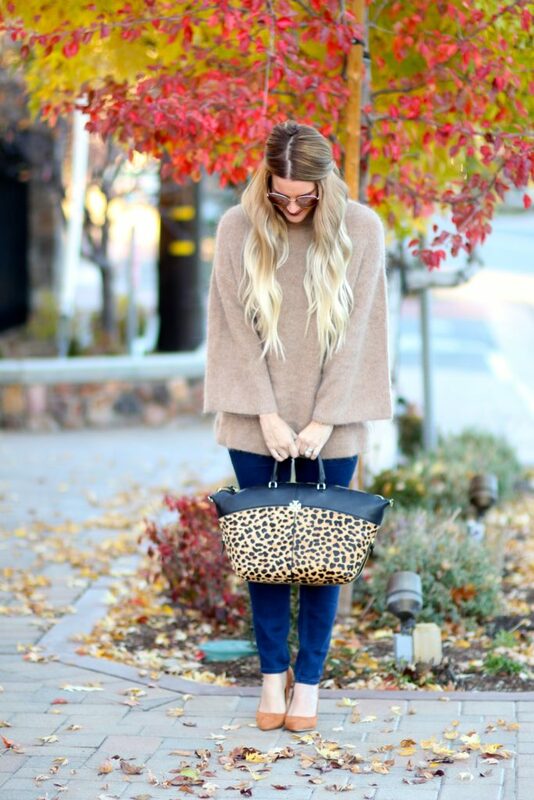 Love that sweater with the flare sleeves, such a cute, cozy look! Of course the leopard is the perfect zing and you are adorable!! Enjoy a peaceful laid back weekend my love!! I love the sleeves on this sweater, so adorable! You bag is beautiful and perfect with this outfit!!! This sweater is perfect! I love the sleeves. Gorgeous photos too, it is looking like Fall! What a gorgeous jumper! I love those sleeves! of course, you look adorable again! I love those statement sleeves, lady- and this jacket looks so cozy! Oh I love your brown shoes and that bag! Love leopard! That sweater looks so luxe and cozy! I’m loving those sleeves! That sweater is amaaaaazing. Wouldn’t it be fabulous on long haul flights? It looks so cozy! I love Fall and all the leaves! This sweater looks so so cozy! I love the sweater, it looks so warm and comfy!! 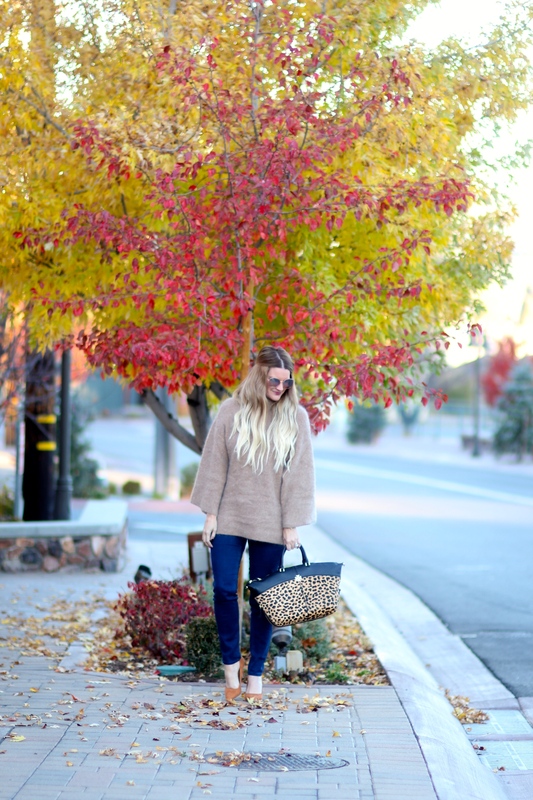 Such a perfect neutral sweater! And that bag is such a fun pop! That sweater is to die for! Love it! Great color, and it looks so cozy too. Love the bag as well! I love your sweater!! 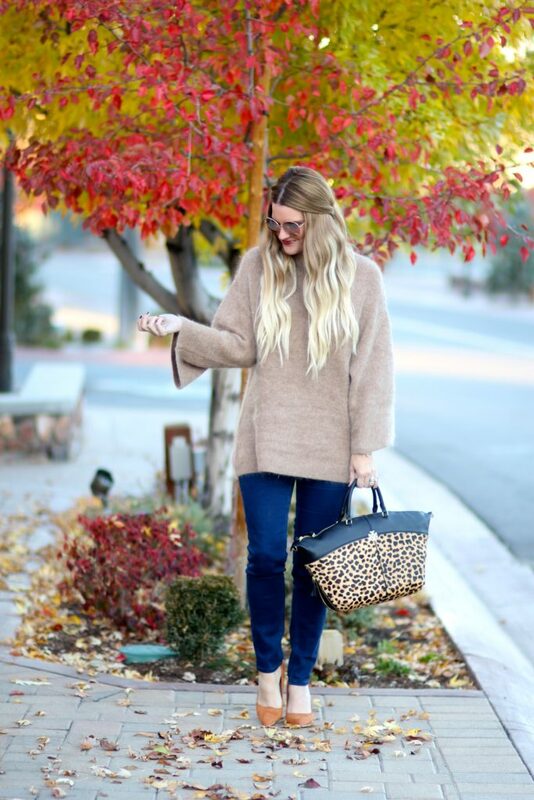 The color is too cute and the bell sleeves make the sweater look so cozy! Shauna, I love this look on you. You look so stunning and the color is perfect. I love how you added that bag to make it such a fun outfit! Loved reading this. Please check out my holiday gift ideas and guide for her & him! Goodness, the background of your pictures is too beautiful. I love the bag and shoes. This sweater looks beyond cozy, and I’m loving the sleeves! Have a wonderful and relaxing weekend. This definitely looks like such a warm and cozy sweater! I bet you did stay warm in the mountains! Your hair is really cute how you styled it. Have a great weekend! We have out first really chilly weekend and I’m so wishing I had this cozy sweater!! Loving that bag too. WOW, what a stylish look! 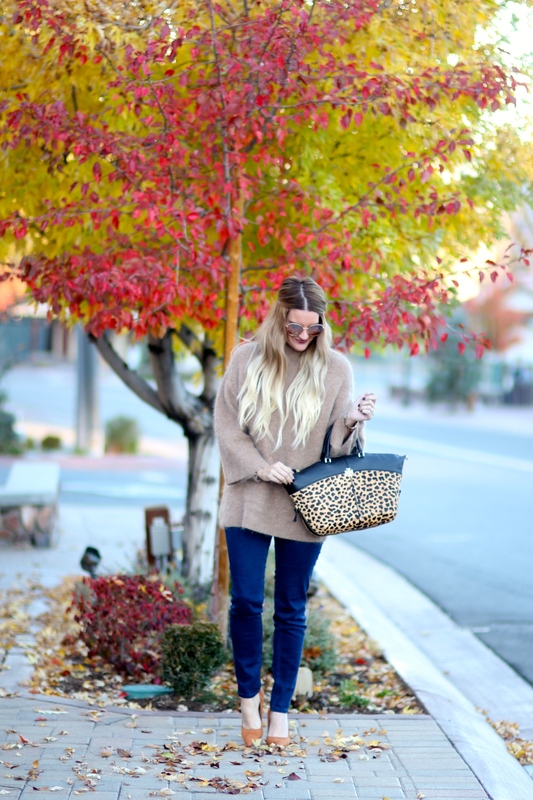 The bell sleeve sweater does look so cozy, and I really love your stunning leopard tote!